November reminds me of my final autumn days as a resident of Yosemite National Park. I had come to the park at the age of eighteen, looking for something I had not yet found within myself. Many stragglers had come to work in the forest for that very reason—lost, fallen, or beginning, we were all at a crossroads somehow, and most were far older than me. I had worked that spring and summer and fall in the Valley, making beds and cleaning shower-houses, so that every night I would go to sleep in the place that I loved, and every day I would wake with awe and wonder in the place that I loved. We carried ourselves with the air of belonging to the woods, and park visitors could detect us immediately as we quietly walked among them. Park rangers could spot us among the crowd also, but as long as we didn’t speed around the bends, burn the forest with bonfires, or hurt the tourists, they too left us alone. Mostly, we were all there waiting to get off work. Days off meant hiking, swimming, rafting, campfires, moonlight walks, and lake-edge drum circles. But when the summer’s over the tourists go home, the river floods, sand bags come out, roads freeze and become unpassable—and most park employees scatter like fallen leaves, returning to the world from which they came. After sleeping in an army-issue tent in the snow that spring, and remembering how the night frost seeps into your bones, I was ready to head for warmer climates, though I held out as long as I could and was one of only a few still remaining. No more baking on sunny granite boulders with friends and—showering with others, eating with others, sleeping among others, complaining about the overcrowded valley floor, playing pranks on campers, day in and day out—the silence seemed sudden, and lonely. Even though I had faltered unnoticed through the crowds but for the jangling keys at my waist and the familiar knowing where I was going among the meadows and alpine crevasses, now I felt invisible. When the first snows covered the crimson, lemon, and amber leaves, and a hollow white sky blanched the evergreen Merced River, I walked to keep myself company. The roads out of the mountains were blocked. The campgrounds were empty. The services closed up for the winter. It was just me, walking. Softly padding amid a spectrum of a November colorwheel. And I walked on, the way you walk when you haven’t found what you’re looking for and aren’t in any rush to find it, the way you walk when you’re cold and have Yosemite Valley very nearly to yourself. It was a thing of profound beauty this quiet music of silent snow, like a late afternoon snooze for the forest floor. I stopped in a small clearing and found myself lost, finally far enough from humans that I could say “I am lost,” with a smile and a mild sense of panic. For the fear itself is the thing from which pleasure comes. I would rather have been nowhere else yet could not quite have said just where I was. And as I stood still, unusually still, stiller than I can remember, I realized I was not alone. A small grey and gold dog looked at me with his head turned, like someone at a four-way stop, waving you to go as you wave back, “no you go right ahead.” I had seen many a shy fellow such as this trotting along meadows and darting in trees on warm days of early dusk. But what I hadn’t seen, and what happened next, is that I realized not only was I not alone, but he wasn’t alone either. Behind him, standing in a circle around me, still, watching, expressionless, was a pack of these shy fellows, not ten feet away. At first, my heart leapt—I was lost and alone and surrounded by a “pack” of something. That’s never the beginning to a happy ending. But like hunger, grief, and happiness tend to do, that feeling faded. My inner self, the one that loves animals and is both frightened and fascinated by the “wild,” the one enraptured by El Capitan and the legless climbers that brave its front, the one in love with Yosemite and enamored with wonder at those things made not by the touch of man, nearly wept with gratitude. But first I tried not to breathe. There was something in that moment, private, and sacred that only those who disturbed a natural moment, and yet had been received with grace, can understand. How long had they been watching me? How foolish to think I had been alone, while walking along grooves of earth carved by millennia of those forces that had come before me, and how glorious to peek into a world which would carry on after I was gone. They looked at me, I leaned against a tree. I grinned, sheepishly, and tried to be still for them. And then, they vanished. And so it is difficult to understand how anyone could, come any November or any other time of year, kill a song dog, a wild trickster, a shy dog of nature, so wise and so haunted. It must be a curse upon those who face those sacred moments, and feel compelled to take, rather than to observe. 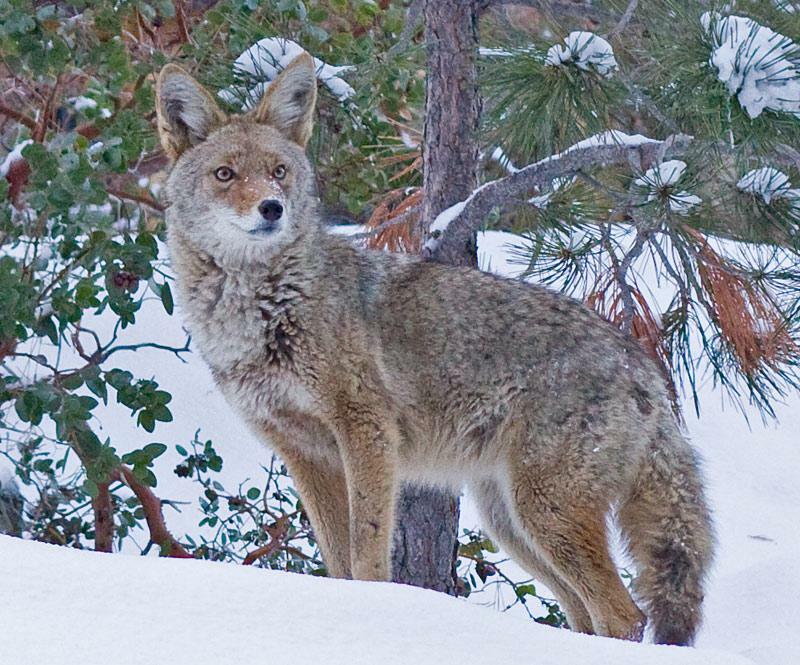 I felt more kinship with those coyotes than I have with most humans ever since. Decades later, I carry that moment within me. Only when you quiet the sounds within can you hear well enough to see, and only when you can truly see can you be truly seen.